Newcastle United have acquitted themselves impressively against the Premier League’s top sides this season – with one glaring exception. The Magpies’ start to 2013-14 was not one to fill their supporters with optimism. With their best player, Yohan Cabaye, refusing to play as he looked to push through a move to Arsenal, and no summer signings (Loic Remy arrived later, but only on loan), a 4-0 thumping at Manchester City did not bode well for the long months ahead. But while City’s dominance at Eastlands was only a taster of things to come as their Alan Shearer-like striker Alvaro Negredo settled in, Newcastle have moved in a very different direction since. It rewarded manager Alan Pardew for keeping matters in perspective. “I have got to be honest and as a staff, we felt we were up against a very, very good side that evening and we were probably the first team to really feel that force,” he recalls. “Their manager (Manuel Pellegrini) has perhaps lowered the individual pressure on the players which has gone into the team and when you have players of that quality, if you can keep the pressure off them, of expectation, then that is the trick. That is why they are very, very good at home. The Magpies will desperately hoping that away form stutters a little at St James’ Park on Sunday after a draw at Blackburn Rovers ended a run of four straight away wins started in Munich. Certainly the rest of the Premier League can only pray Pellegrini’s men cannot replicate the form which has seen them score 38 goals in ten home league matches – double their away tally and more than double Arsenal’s at the Emirates. Even Liverpool only have 27 at Anfield. “It is remarkable, yeah,” says Pardew. “But we do not lie in bed worrying about it. “What you have got to do, which we have done this week, is work on your defensive game, work on the shape of the team and make sure that you ultimately put a challenge in or make a tackle and ruffle their threat. I think if you do not do that, you are going to be in trouble against Man City. New to English football after his £20m transfer from La Liga, Negredo (above) only got ten goalless minutes on his City debut. Now, with 13 goals under his belt, the Spaniard is emerging as one of the Premier League’s deadliest strikers. Pardew sees similarities with Shearer, the division’s most prolific of all time. “I see a lot of similarities in terms of his pace and power and all those assets he brings to the team,” he says. “He’s very much Shearer-like and I am sure Alan looks at him and see a lot of himself in the way he conducts himself in the game. “He adds a real winning mentality to his obvious quality. You do not always get that. “It must be brilliant putting him in the team every week because you just know you are going to get consistency of performance like this club used to get out of Alan. I do see a lot of things like Alan. With goals so easy to come by in Pellegrini’s team, it is vitally important not to give any freebies. After the latest set-piece goal against them knocked Newcastle out of the FA Cup, it is something Pardew’s players have been made to work hard on in training this week. “It is frustrating because in tight games, the old cliche about being beaten by the odd set-play is not easy to take,” Pardew says. “We work on them. We are not the greatest team at set plays, certainly not the tallest. “For example, you are looking at players like that 6ft 8in (Arsenal central defender Per) Mertesacker (he is actually two inches shorter) – you would not fancy marking him at corners. “There are some huge players around (City’s Vincent Kompany and Yaya Toure amongst them) and our players have really got to be on their toes. We have done quite well on that front this year but in the last couple (of games), not so well. 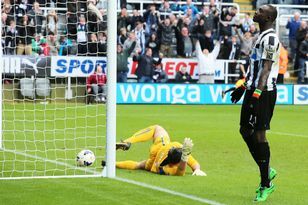 Steven Taylor’s season was also supposed to start at the Etihad, but a 48th-minute red card meant it never really did. It took him until Saturday’s Cup tie with Cardiff City for his second appearance of the season. With Fabricio Coloccini injured, Mathieu Debuchy suspended and Davide Santon facing a fitness test, there is every chance Taylor could get a shot at redemption tomorrow. “Yes, it would be,” Pardew says. “I did not think of that. Perhaps he owes us a little bit for that one.